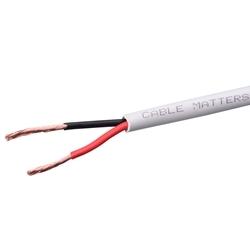 * Cable Matters speaker wire features 2 conductors made of 100% oxygen-free copper as opposed to copper clad aluminum (CCA) wires. * Each conductor is jacketed with color-coded PVC for easy polarity identification. Each roll includes a plastic spool for easy and convenient installation.